Let’s look at the range of features that iMessage offers that are great for business use. All those are great features that go beyond simple messaging using the Internet rather than texting. iMessage really has a lot going for it. Let’s look at why you might opt not to use it. First and foremost, iMessage is a proprietary Apple technology. That means it simply isn’t an option when you need to message someone who uses an Android phone and a Windows PC – there’s no Apple device where that person could receive your message. Even if you’re messaging someone with a Wi-Fi iPad or MacBook, he or she might not get the message immediately if not near either device. As popular as the iPhone is, unless your workplace, client base, friends, and family are all iPhone users, then iMessage won’t always be a viable option. Another problem is that iOS currently offers the ability to receive messages using your iPhone’s phone number, your Apple ID, and various email addresses (as does FaceTime). 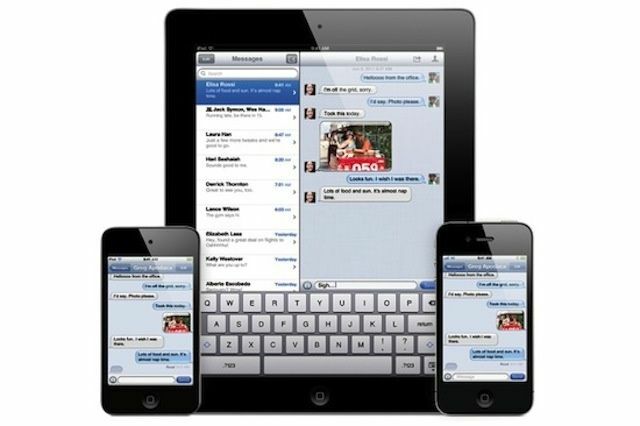 If you send a message from your iPhone, you may not see the response on your iPad. It’s worth noting, of course, that Apple is working on resolving this issue and things will work better in iOS 6. Then there are the stories of messages being received on the wrong iOS devices. The most famous of which involved an Apple store Genius. Other reports involve lost or stolen phones. The Verge published the results of some tests and confirmed that swapping a SIM card between two iPhones can reproduce the issue. Apple’s response was that the Genius involved had acted outside of store policies and that the issue can be resolved by toggling iMessage on and off. Odds are that iOS 6 will resolve this issue as well as the issue with messages not being pushed to all your Apple devices. That type of incident raises another concern, however, one that Matthew Green, a cryptographer and research professor at Johns Hopkins, voiced in a blog post this weekend. We still don’t how iMessage actually works. It appears to be a particularly complex system – perhaps more than it needs to be. It also makes independently verifying Apple’s description of the service extremely difficult. When you’re dealing with confidential information, particularly in a heavily regulated industry, that’s a big concern. A final concern is that users may not even realize whether they’re sending messages via iMessage. That could lead to confusion about the messaging features available and the security of the message. Granted most iOS veterans and tech-savvy users may recognize the difference, but many people may not know that green chat bubbles mean SMS and blue ones mean iMessage. Does this mean iMessage shouldn’t be used in business? Not entirely, but it definitely means businesses should be aware of the potential issues involved. It also means that an alternative messaging system like TigerText, which we profiled earlier this year, may be a better option in terms of security, feature set, and multi-platform support.